A once bubbly and engaging child becomes sullen and withdrawn, or irritable and a bully on the playground. School tardiness or absence becomes frequent, and grades drop. A parent cannot seem to “get through” to a child to discuss what’s wrong, and tension in the family rises. Depression is a common and serious childhood mental health disorder. Until as recently as the 1980s, physicians and other specialists rarely considered that children could become depressed. But research has shown that they do, suffering many of the same symptoms that are seen in adults with major depression, but also some that are unique to their age. When recognized early and diagnosed accurately, depression is highly responsive to treatment; still, each episode of this illness tends to increase the likelihood that incidents of this chronic disease will recur; and, thus, depression must be treated and managed with an eye toward the long term. As many as 5 percent, or one in 20, of children and adolescents, experience a potentially disabling depression before age 19. This frequency of occurrence, or prevalence, of depression at young ages – and the fact that fewer than half of those who have the illness receive appropriate treatment – helps explain why depression is now the leading cause of disability among adults in the U.S.
Several forms of depression affect children and adults alike. Specific signs and symptoms characterize major depression; suffering at least five of these symptoms for two weeks or more is a highly reliable marker of depression. In dysthymia, symptoms generally are less severe, but a more chronic and persistent course marks the illness. Rather than shifting episodically into distinct periods of depression, the child with dysthymia lives in world tinted a joyless gray. Less frequently seen in children (or adults, in whom the annual prevalence is about 1 percent) is bipolar depression, a phase of manic-depressive, or bipolar disorder, in which periods of depression alternate with periods of unnaturally high levels of energy and grandiosity. Does my child have a mental health disorder? The question is difficult, even frightening, for a parent to voice. Understandably, it is easier to overlook or explain away subtle signs of illness that may occur periodically at worst and are set against the rapid changes of childhood or the turmoil of adolescence. “It’s just a phase.” “He’ll grow out of it.” “She’s under a lot of stress.” “We need to assure him that we love him.” “No one in our family has a mental illness.” Yet the concern that sparks a parent’s question may be justified. One in five American children and adolescents has a mental or behavioral disorder that interferes with their ability to learn in school or to establish healthy relationships with family members and friends. For one in 10 youngsters, a mental health disorder will lead to moderate to severe impairment in one or more facets of their life. No single cause of depression has been identified. However, we know that depression is an illness with a pronounced biological basis. The genes that we inherit, and which continue to be influenced by experience throughout life, may predispose a person to the illness, but this predisposition, or vulnerability, to depression is typically“triggered” by life events. Researchers have begun to identify these triggers, called risk factors, for depression. A child’s risk for becoming depressed may increase with stress or with an experience of devastating loss or trauma. Behavioral problems and mental health disorders —for example, conduct, attention-deficit, learning, anxiety, and substance abuse disorders — frequently co-occur with depression and may help explain its onset. A family history of depression or bipolar disorder is a significant risk factor for depression in a child or young adult. Depression may — and frequently does — occur when no member of a family has knowingly experienced a severe mental disorder. The underlying biological mechanisms and triggering events for illness in these instances have yet to be clearly understood. What can be said with certainty is that in children, no less than in adults, clinical depression is not a character weakness, normal sadness, or a passing phase. It is a real medical illness that can be accurately diagnosed and effectively treated. Indeed, a child’s response to appropriate treatments is a valuable way of validating the presence of the disorder. What is the Risk of Suicide? Suicide frequently is a direct and lethal outcome of depression. When a teenager thinks or talks about suicide, the risk is real. Children should understand that if a sibling or friend discusses suicide, it should be called to the attention of an adult. A suicidal gesture should not be viewed as attention-getting, but as an anguished cry for help. The mid-1960s marked the start of an alarming, three-decade-long increase in rates of suicide by young white males, a tragic incline that has been followed more recently by young black men. Each year in the U.S., almost twice as many adolescents commit suicide as dying from all natural causes combined. Not even pre-teens are immune. 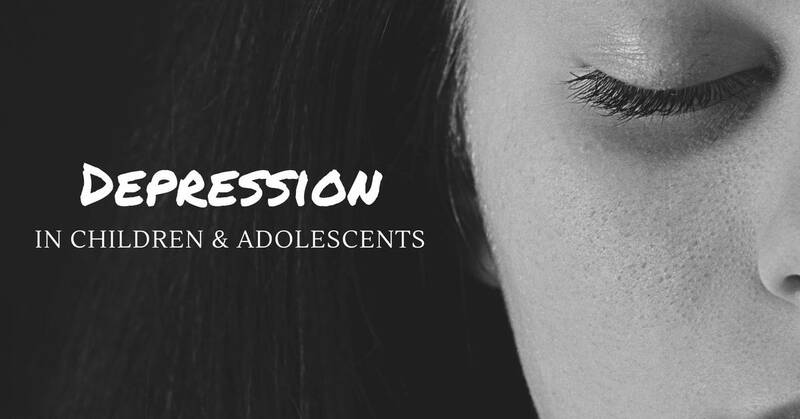 A recent downturn in rates of adolescent suicide may reflect the increasing and widespread use of safer and more effective medications to treat depression. Suicide remains a public health crisis, however, that demands research to improve preventive strategies. How Can We Recognize Depression? Extensive research has identified the signs and symptoms of major depression. In children, doctors are learning, classic symptoms often may be obscured by other behavioral and physical complaints – features such as those bracketed. At least five symptoms must be present to the extent that they interfere with daily functioning over a minimum period of two weeks. Treatments for depression are well-defined and effective for the vast majority of those with the illness. Teachers, or a pediatrician or other health care provider, often are the first to put a name to the changes in a child’s behavior that are seen with depression. Your child’s doctor can rule out the presence of general medical illnesses that might present with some depressive symptoms and, in some instances, may be willing and capable of treating depression. Often, however, seeking specialty care is advisable. A mental health professional can verify a suspected diagnosis and help a parent and child understand the array of different treatment options as well as their benefits. Ideally, a treatment program will combine psychotherapy and medications. The former relies on age-appropriate communication as a tool for bringing about changes in a patient’s feelings or behavior. While different types of therapies tend to be offered in various communities, research has shown that “here and now” approaches that concentrate on solving problems (rather than on gaining insight into psychological processes) are preferable. Two specific forms of therapy, cognitive behavioral therapy, and interpersonal therapy have now have been validated by research to be effective in treating depression in youth. Parents should be encouraged to ask a therapist specific questions up front: for example, how frequently and over what period of time will therapy take place; whether sessions will involve the depressed child alone, or others in the family also; and how the therapist will assure confidentiality to a child or teenager without locking parents out of the process. Antidepressant medications target chemical imbalances in the brain that are associated with depression. Several antidepressants introduced in recent years have little potential risk for dangerous overdosing or adverse effects and are quite reliable in adults. Recent studies indicate that these medications can be useful in treating youth depression as well. Additional studies are ongoing to further define the efficacy of these medications in children and adolescents. Parents should ask their physician for details about the purpose of a medication; how long it will take to exert therapeutic action; the frequency with which the physician will evaluate the effects of the treatment and need for dosage changes; and any precautions (for example regarding diet, exercise, side effects) to keep in mind. The child or teen patient should also have age-appropriate information about the medications. In 2004, after a thorough review of data, the Food and Drug Administration (FDA) adopted a “black box” warning label on all antidepressant medications to alert the public about the potential increased risk of suicidal thinking or attempts in children and adolescents taking antidepressants. In 2007, the agency extended the warning to include young adults up to age 25. A “black box” warning is the most serious type of warning on prescription drug labeling. The warning emphasizes that children, adolescents and young adults taking antidepressants should be carefully monitored, especially during the initial weeks of treatment, for any worsening depression, suicidal thinking or behavior, or any unusual changes in behavior such as sleeplessness, agitation, or withdrawal from normal social situations.